So, West we went. Friday’s journey was less strenuous than our first day on the road. Thursday, we dove 300+ miles up and over the low mountains of West Virginia. Friday was a much easier 232 miles due West through the rolling hills of Kentucky. As we continued our westerly trek, the grass became greener and the land began to open up a bit with less dense forest areas and more openness. I can see how many settlers following the “Go West” dream made the decision to stop in Kentucky. 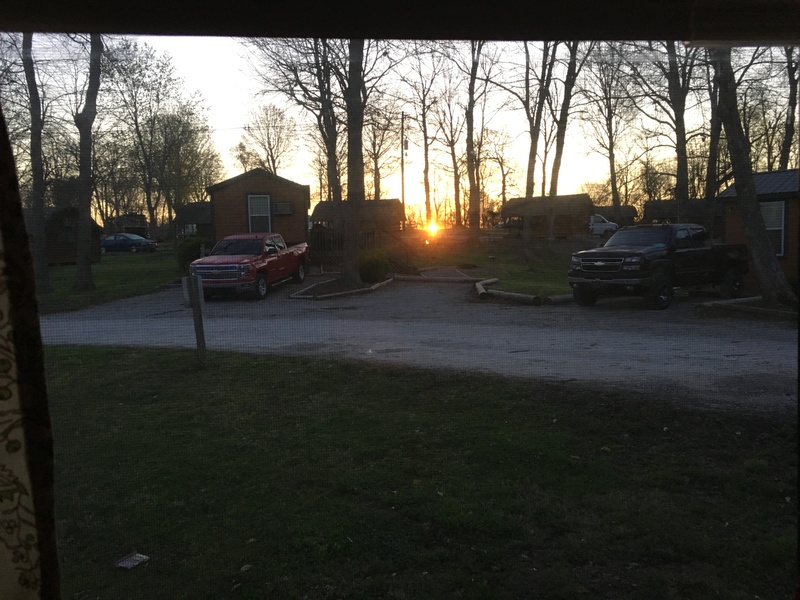 We got on the road earlier on Friday than Thursday so we knew we would have time to rest a little before grabbing a bit of dinner in Shepherdsville, KY. We did take a lunch break at a truck stop along I-64 at Mt. Sterling which just happened to be close to the mid-point between Charleston, WV and Louisville, KY. While we were temped to go into the truck stop and grab a Subway sandwich, we opted to stick with the plan and fix our own lunch, thus saving a little $$. While Carol gathered the lunch stuff, I walked the fur babies. They were ready for their potty break just as we were. One advantage of traveling in an RV is not having to wonder what surprises may lurk in the facilities found along the highway. Friday’s lunch spot was also off the highway so we were not rocked with each passing truck. After cleaning up from lunch, we took off. I quickly realized the direction I chose to exit the truck stop led to a dead-end. Because we were in a truck stop, I was able to get turned around quiet easily and negotiated Cramalot Inn back to I-64. Between Lexington and Louisville, I noticed the traffic began to increase and that we were apparently in the middle of horse country. While the roads were crowded, the surrounding country opened up with sprawling estates configured with horse pastures and buildings looking more like horse stables than typical cattle barns. GPS routed us around loop I-265 bypassing central Louisville. That was fine with me since we will get back into Louisville with our car on Saturday. We made the connection to I-65 south and made the exit at Shepherdsville on KY-44. As we crossed over I-65 heading east to our spot for the weekend, we encounter a school zone. Kids, cars and school buses everywhere; looked like someone stirred ant mound. It was obvious, the students knew it was Friday. 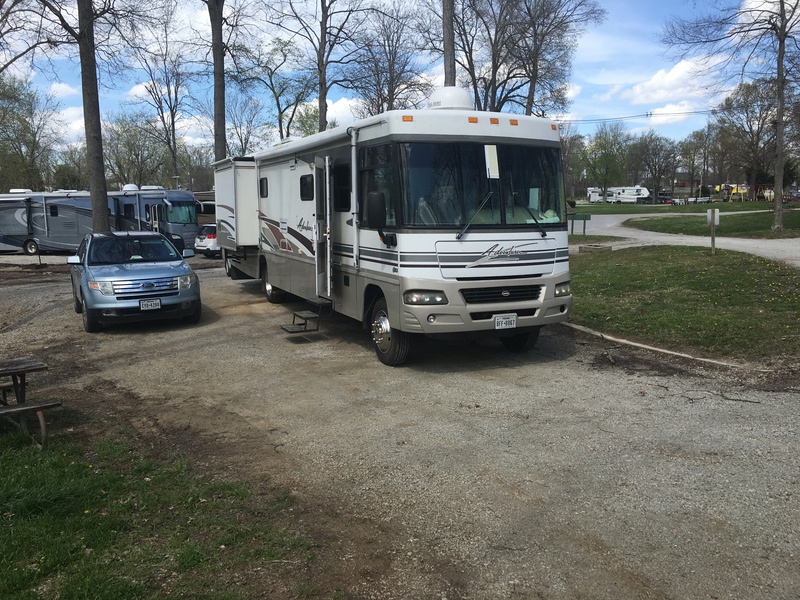 We pulled into our spot at the Louisville South KOA and anchored just fine. This park is much larger than where we were Thursday evening and there are more people buzzing about. No one has commented about the ‘band-aid’ on the windshield just yet. This is one reason why we are making a stop in Nashville as we head south Sunday afternoon. We picked up a stress crack in the windshield in 2013 as we left Mark Twain Landing in Missouri. It was a small crack and really nothing to worry about. While we were parked in Virginia, we heard a rather loud pop sound. A lawnmower was in the area so I suspected we were hit by a flying object. We look around the RV on the outside and could see no evidence of a ding or any thing that looked like damage from a flying object. A few days later we noticed the crack had grown significantly and the top corner of the windshield had some small, loose shards of glass. We called around various glass shops in the area and found none that had mobile glass service and none that had any experience working on RV windshields. Closest spot would be Washington DC, Richmond or Roanoke. After going a few rounds with various glass companies and our insurance, we did find a mobile service that could accommodate us in Nashville, which just happened to be along our route. The band-aid is a piece of fiberglass reinforced panel similar to what is found in commercial bathrooms. I cut a piece to cover the crack and secured it with duck tape. The panel distributes the wind pressure to other areas of the windshield. So far it has held just fine. Monday we have an appointment in Nashville with a mobile glass service to replace that windshield. I’ll let you know how that goes then. Meanwhile, we are on vacation. Today, we plan to visit Louisville and play tourist. We will hit the Derby and Louisville Slugger museums along with a few other spots. I leave you with a sunrise photo from the dining room window. It is going to be a beautiful day.